Manual materials handling is performed by many types of workers in the mining industry, including maintenance workers, electricians, mechanics, laborers, and some equipment operators. Restricted workspaces common in underground mining and lack of proper workstation design in many plants and shops contribute to injury risk for workers performing tasks with manual materials handling components. Manual materials handling represents a critical and persistent source of injuries in many industries including mining and is commonly the largest category of nonfatal, lost time injuries. Injuries can affect more than just the back—shoulder injuries are also reported. A recent analysis found that shoulder strains resulted in lost work days with a median over five times that of back strains. Traditional workplace safety practices target the back and may neglect the impact of shoulder injuries, which are known to have an increased prevalence in older populations and require significant healing time. Additionally, when lifting in a kneeling posture, there are added risks for injury to the knee structures. 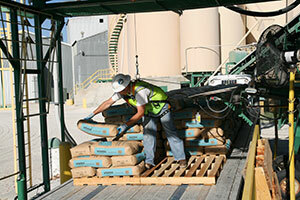 Worker performing manual materials handling while palletizing 100 pound bags of sand. One of the tenets of injury prevention is education and resources. The NIOSH Mining Program has created several training packages to educate mine workers on ergonomic risk factors as they relate to mining workplace practices. Additionally, NIOSH Mining also promotes the use of mechanical assist devices to reduce the necessary force application as well as lift tables and workstation redesign to promote improved posture when lifting. Research studies have been conducted to examine the impact of manual materials handling when in restricted postures, when working in workstations of varying heights, and when performing repetitive stacking tasks. Posture is a significant factor in manual materials handling. Even moderate weights can cause an increased risk for injury when lifted incorrectly. Posture can be influenced by several factors which can be personal as well as environmental. Restricted vertical heights require workers to stoop, squat, or kneel which reduces lifting capacity. Stacking on pallets located at floor level requires workers to fully flex their back. Stacking on pallets exceeding shoulder level requires shoulder flexion to access higher areas. Non-adjustable workstations may also require awkward postures for some workers. Research will continue in this area with the hopes of providing better education on safe workplace practices and workstation design for manual materials handling and ensuring mining companies are aware of devices to improve worker safety when performing these tasks. Additionally, publications are available with recommendations to reduce injury risks associated with manual materials handling.